Maya McClean entertains the PCEC audience with several of her original songs as she also discussed her past music and entertainment career and her current endeavors as a life coach. 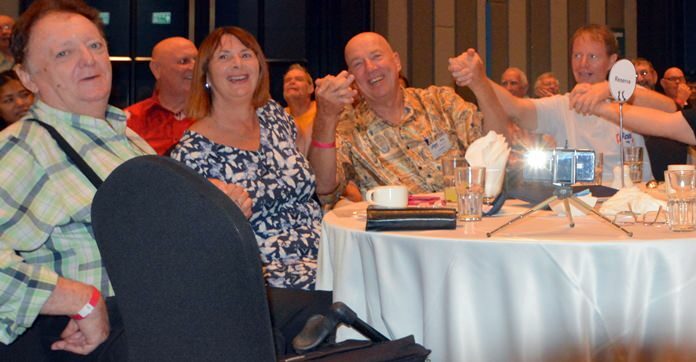 The Pattaya City Expats Club provided a morning based on the theme ‘Words and music’ at their Sunday, July 22 meeting, with not so much a speaker as an all-around entertainer and spiritualist to liven up the venue. Maya McClean graced the meeting with a very special morning of entertainment and enlightenment through her message to “live your highest truth;” the theme for her life coaching. Maya, whose youthful looks truly belie her age, is one of two musically talented twin sisters (“The Twinz” Maya & Nandy”) born in Sydney, Australia, but growing up in Darwin. She also spent several years in the USA. Maya is very proud of her Aussie roots and is a confident singer/songwriter who has carved herself an extremely interesting and successful life based around her focus on following her heartstrings as much as the guitar strings. Maya has a catalogue of music to evoke many emotions depicting the journey through her packed and interesting life so far. Maya started the morning off with a composition entitled “Flow”, a song written about living a life of being and feeling connected with the universe. 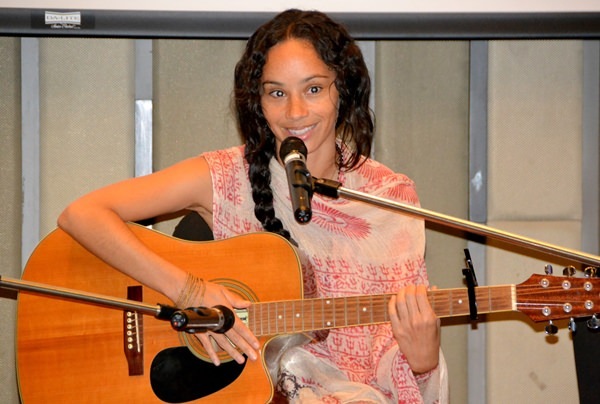 Maya intermingled between music, personal thoughts, ideas and inspirations whilst creating a one on one connection with the audience; an amazing ambience of cozy intimacy including the opportunity for a holding hands joint singalong to finish. During her presentation, she treated everyone to her original songs “Love Yourself”, “Into the Sun”, “Flow” and “Beautiful”. Maya explained how in her younger years she tried the traditional route in life of achieving material possessions and the security of a job, but deep down she just felt trapped by it all and her only escape was to disappear into nature and create music alone on the beach. With her burning desire to just follow her “American Dream” she turned her back on this lifestyle and ventured into the unknown instead. She expressed how one of her life’s ambitions was to be able to dance with no less than Michael Jackson… whilst that may have been every girl’s dream, the difference is that Maya actively pursued hers…although this dance was sadly not to transpire. Maya’s belief and passion in that journey brought her into contact with “Prince” (‘The Artist formally known as’) working alongside him as a dancer and backup vocalist; becoming a close friend, not too much of a surprise as Maya also has a very exquisite singing voice. Being an Aussie, Maya joked that she went from being a convict slave and illegitimate child to being a true Princess by working with Prince. After her venture as a backup singer and dancer, Maya and her twin sister released their debut album “Target Practice” with their band Heroine December. With encouraging feedback from fans and industry critics alike, Maya stepped into the world of music video and film production in a big way, landing Executive Producer credits for Prince’s music video “Breakfast Can Wait.” With that success and confidence, it positioned her even more to write, direct and produce other short films and documentaries including “The Lamp,” “iPhoto”, “Hair” and “Blind”; each winning various film festival awards. 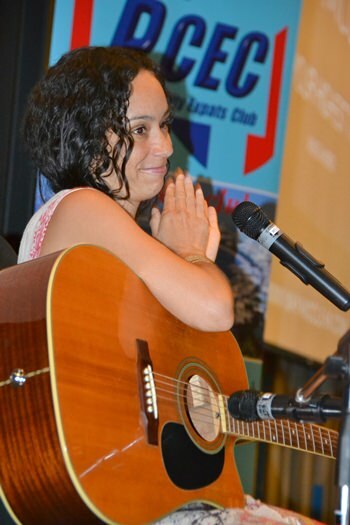 Maya McClean smiles as she receives applause from her PCEC audience after singing her endearing original song “Beautiful”. To hear her sing this and other of her songs, visit http://mayamcclean .com/music/. Another strong passion for Maya is that of being a spiritual lady with both feet on the ground who is a Life coach. A solo artist, Maya uses her angelic voice and transformative lyrics to spread the love with a healing message. Offering workshops called, “Live Your Highest Truth” (LYHT), where she guides others in living a spiritually aligned life; and private LYHT alignment sessions, concentrating on natural healing massage both aimed at strengthening one’s core balance. She looks to help people from all walks of life work through self-limiting thought patterns which can hold them back whilst creating inspirational connections with their true inner self. Together with concentrating on what is life’s positive possibilities, she can bring someone to allow their spiritual feelings to be a guiding influence, as well as learning to think, feel and to live more in the “now”. 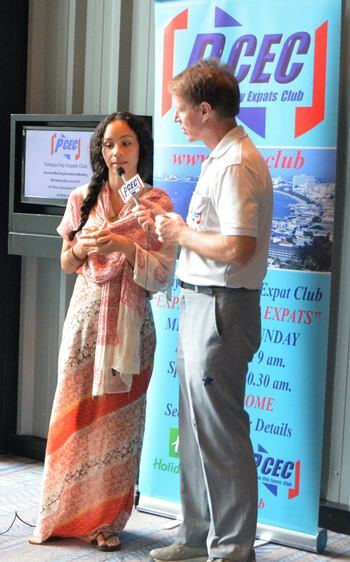 Maya offers coaching on an individual basis and is also planning a presentation here in Pattaya. To find out more, email her at [email protected] . To learn more about Maya, visit her website at: http://mayamcclean.com/. 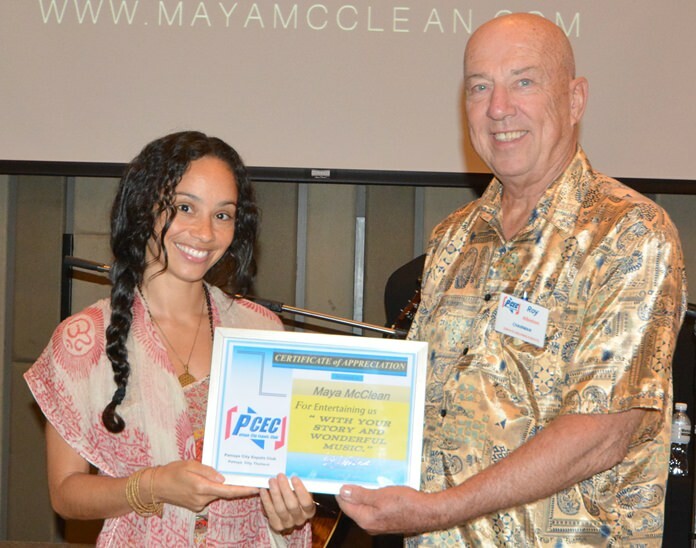 MC Roy Albiston presents the PCEC’s Certificate of Appreciation to Maya McClean thanking her for bringing her music and message about how to “Live a Higher Truth”. Member Ren Lexander interviewed Maya McClean after her presentation to the PCEC. To view the video, visit: https://www.youtube.com/watch?v=6XrHIJZgSHY&feature=youtu.be. Member Ren Lexander interviews Maya McClean after her presentation to the PCEC. To view the video, visit: https://www.youtube.com/watch?v=6XrHIJZgSHY&feature=youtu.be. The PCEC audience gets into the mood as they join hands at the behest of Maya McClean as she entertains them with her beautiful singing voice.